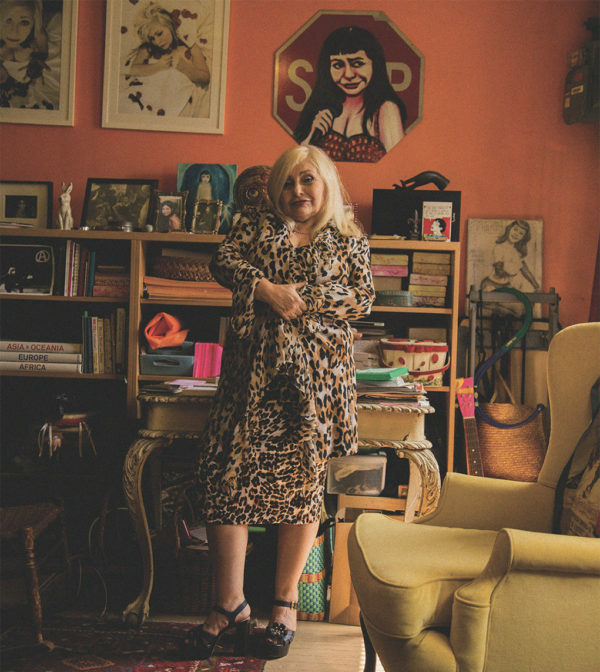 PENNY ARCADE PHOTOGRAPHED AT HOME IN THE LES, NYC. (AUGUST 2018) BY LIA CLAY FOR GAYLETTER MAGAZINE. Penny Arcade’s newest show, “The Faghag & Her Friends in The Summer of Love,” is running this weekend only (December 6-8) – and you don’t want to miss it. As she told me in our interview for Issue 9 of GAYLETTER magazine, she writes all her own work, and develops it live in front of audiences. She’s probably the only performer who makes her work in public, and you have the chance to see the latest living incarnation this Thursday (12/6) to Saturday (12/8). Following sold out performances at Joe’s Pub earlier this year, this new iteration integrates film and media into her characteristic style of real history and blistering wit. In a time where Tr*mp officials delete LGBTQ lives from the census, the CDC bans the term “transgender,” mainstream media glosses over George H.W. Bush’s role in perpetuating the AIDS epidemic, and digital platforms like Tumblr remove all “adult” content, we need Penny’s work more than ever. Her performances are important transmissions of queer history through the lives she portrays, searing critiques of the gentrification of New York, and also just totally thrilling and captivating entertainment. Don’t miss the chance to see a living legend of downtown performance art at the peak of her powers. For the low price of $26, you can time travel to the late 1960’s and visit Warhol’s Factory, Provincetown, and New York City’s criminal, intellectual, psychedelic, homosexual avant-garde. $26 with code “GAYLETTER,” 7:30PM, Baruch Performing Arts Center, 55 Lexington Ave. (enter on 25th) NY, NY.